FOIMan considers how the General Data Protection Regulation (GDPR) affects the Freedom of Information Act (FOI) and its administration. My first love is (when it comes to information rights anyway), of course, FOI. So given that I’ve been giving so much thought to GDPR, it made sense to think about how the new law affects FOI. A few months ago I blogged briefly about an obscure schedule of the Data Protection Bill (hopefully soon to become the Data Protection Act 2018) that made amendments to FOI in order to ensure that the exemption for personal data will still work effectively with GDPR. It’s important that these changes happen otherwise there would be a conflict between FOI and the new data protection regime. Not making them could lead to personal data being disclosed when it shouldn’t be, or, as I indicated in my blogpost, to less information being disclosed than might have been in the past. However, GDPR doesn’t just mean changes to other legislation. It means that any organisation processing personal data has to ensure that that processing meets its requirements. That includes public authorities. What might be forgotten is that the handling of FOI requests invariably involves the processing of personal data. Some of that processing will be expected by applicants and will be easy to justify; some of it won’t be. 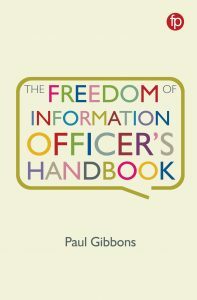 When I gave a presentation about this to a group of practitioners in December, there were some audible gasps (of recognition primarily) as I listed some of the things that public authorities routinely do with personal data whilst processing FOI requests, but are often done without much thought. It’s not necessarily that those activities are wrong, you understand; but GDPR (if not the current Data Protection Act) requires all public authorities to give some thought to how they are justified. They’ll also need to ensure that they meet the other requirements of GDPR. 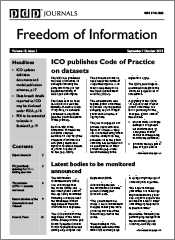 In my latest piece for PDP’s Freedom of Information Journal I’ve looked at the FOI amendments in the Data Protection Bill (at least as it stood in October when this piece was written). 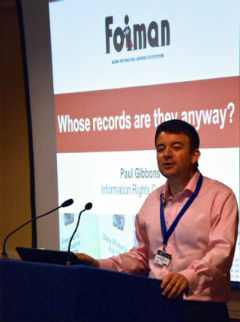 I’ve also examined how FOI requests are handled and what practitioners will want to be looking at to prepare for GDPR. A lot of the things I discuss will be relevant for other correspondence processes as well. Have a read. I hope it gives you some food for thought at the start of what will be a very busy and interesting year.